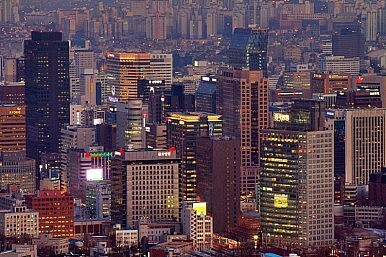 South Korea’s Economy: Back on Target? Its latest quarterly GDP figure beat estimates, but some challenges remain. South Korea’s football team may be firing blanks at the East Asian Cup, but the national economy has started scoring goals again. On Thursday, Asia’s fourth-largest economy beat expectations by posting its fastest growth rate in more than two years, expanding by 2.3 percent on an annualized basis following increased private consumption and government spending. The 1.1 percent rise in gross domestic product for the June quarter exceeded the 0.8 percent growth of the previous quarter, beating the median 0.8 percent estimate of economists polled by Bloomberg News. According to the latest data, private consumption grew by 1 percent although investment sagged to just 0.5 percent growth. Exports expanded by 1.5 over the quarter, down from the previous quarter’s 3 percent gain as the weaker yen reduced competitiveness. ANZ economists Louis Lam and Raymond Yeung described the figures as “encouraging” in the face of slowing growth in China, the nation’s biggest trading partner. “We believe the economy has bottomed. Growth prospects are set to further improve in the [second half] as the US markets are recovering and [the] impact of the supplementary budget is kicking in, albeit at a gradual pace,” they said in a statement. In its April 2013 World Economic Outlook, the International Monetary Fund forecast the republic would expand by 2.75 percent this year on the back of improved exports, reaching 3.9 percent in 2014 after the sluggish 2 percent growth achieved last year. The authorities have been in expansion mode lately, with government spending up 2.4 percent in the latest quarter, including the impact of a $15.5 billion extra budget. The Bank of Korea (BOK) expects the economy to achieve 4 percent growth next year due to the fiscal and monetary stimulus. “Today’s data will reduce calls for further monetary easing. The next rate move for the BOK will be a hike,” Tonyang Securities analyst Lee Jae Hyung told Bloomberg. Despite lower interest rates, house prices have dropped 0.2 percent in the first half of 2013 after ending virtually flat the previous year, with the government attempting to stimulate the market through demand and supply-side measures. Rising debt servicing costs have weighed on spending, with household debt reaching historical highs at 75 percent of GDP. Nevertheless, South Korean businesses and consumers are not feeling the benefit of any pickup. According to a survey by the Korea Chamber of Commerce and Industry, nine out of 10 businesses “take a dim view of the future of the economy,” the Chosun Ilbo reported. The South Korean daily said 87 percent of those firms surveyed had yet to see any evidence of a recovery, with the main issues being poor sales, declining profits and reduced orders. “Almost 27 percent of the companies expect conditions to get worse in the second half of this year, and only 21.4 percent expect them to improve,” it said. Consumers were equally gloomy, with a Nielsen survey finding Korean consumers scored half the average consumer confidence level in Asia. About 90 percent were pessimistic about the labor market, with 79 percent downbeat on their finances. "Consumer confidence is gradually recovering in China, Japan and the U.S.," Nielsen Korea’s Shin Eun-hee was quoted saying. "But there is still no sign that it will get better in Korea due to a tough job market and worsening financial situations of many households." The OECD’s Adrian Blundell-Wignall told a business economists meeting in Sydney on Thursday that the weaker yen would continue to hurt other Asian economies including South Korea, China and Taiwan, with the situation worsening should the US dollar start appreciating. “When the yen weakens, and the yen has already weakened because of what they have done in Japan, and if the US dollar were to start rising on the basis of US growth and interest rate expectations in future, this would give a double whammy and make it doubly problematic for Asia,” he was quoted saying by the Australian Financial Review. Further clouds include worsening ties with North Korea, with the two countries ending Thursday their sixth round of working-level talks on the future of a joint industrial zone in Kaesong without reaching agreement. Winning the East Asian Cup could deliver a confidence boost, but like its footballers, the South Korean economy faces some tough defenses first. Heightened tensions on the Korean Peninsula are already impacting regional economies.